In his excellent book, "One Up on Wall Street," Peter Lynch used many charts that look like the one below to illustrate the valuation of stocks. In this chart, Peter Lynch drew the stock prices on the right axis and the earnings on the left axis. The charts are in logarithmic scale. He aligned the value of $1 in earnings per share to $15 in stock prices. Therefore, if we draw in stock prices, the “earnings line” he mentioned above is equal to the stock prices at a P/E ratio of 15. Warning! GuruFocus has detected 6 Warning Signs with WMT. Click here to check it out. 1. Fill in "15" in Price at "P/E = 15" and check the checkbox. 2. Click on "Logarithmic" in the top right corner. According to Peter Lynch, the best buying time will be when the green line (price) is lower than the blue line (earnings line). In this case, it would be around the middle of 2011. Indeed, if you bought Wal-Mart in June 2011 around $54, you have gained more than 40% in about two years. Not bad from a large company like Wal-Mart. Is Wal-Mart a good buy right now? Probably not, as the price line and the earnings line are almost overlapped. This suggests that the stock is now fully valued. Try our financial charts here. If you are an affiliate of GuruFocus, your affiliate code has been embedded into the chart. Update: We have added Pre-defined chart settings in our Interactive Charts. You can select "Peter Lynch Charts" there and it will be displayed immediately. Why P/E = 15? average price of the market? P/E=15 is what Peter Lynch used in the chart. Thank you.This site is awesome! Although Peter Lynch said in his book that the fair P/E ratio should be equal to the growth rate. But for the charts, he used P/E=15 for all companies. That is also what we are doing in Peter Lynch Charts. I would like to mention that almost every week,here in Gurufocus , Mr. Chuck Carnevale analyzes a company by his fundamentals analyzer software tool-FAST Graphs ,using the same idea of Peter Lynch to illustrate the valuation of a stock . When I use price and price at PE 15 (or Price at any multiple, for that matter) the lines are don't separate. the PE box doesn't seem to work. @Steve, Please try again. I just fixed the problems. and find the line "Pirce at P/E=15" and click on the checkbox. did you get error message? How is this any different from simply saying, "Buy at a p/e below 15, and sell at a p/e above 15"??? can you let us know which version of Internet Explorer you used? How is this any different from just saying buy when the p/e ratio is below 15? "How is this any different from just saying buy when the p/e ratio is below 15?" PE Ratio of TTM or Forward? Thanks. We only use TTM ratios. There's a typo; "changes" should be "chances" in the quote. I just want to understand the math behind this. I know in the book that Peter Lynch does do this, but how does it make sense. I mean: What would the P/E of a stock price normally be at, if it were not 15. I just want to understand the math and logic behind the reasoning. The example in the video doesn't use "Logarithmic" scale but Peter Lync was using a logarithmic. Also in the text above, it says "click Logarithmic". Which one should we do to get the exact Peter Lync chart? Or does it really matter? Log or not does not really matter to see the valuation. The way Peter Lynch drew has to use logarithmic. But we scale the earnings up by a factor of 15, it gets the same results as the way Peter Lynch drew. Would it make a difference if we found the PE for a particular stock and put that # in the chart instead of 15? Why don't your predefined "Peter Lynch" charts seem to use the log scale? Could someone please explain the math behind this? In his book, Peter Lynch draws a price and EPS line. When the EPS is 1, the price is 15. I understand that. Nevertheless, is Gurufocus's Peter Lynch graph doing the same thing as he did? What does "Price at P/E=15" actually mean? To full replicate the earnings line, the EPS must be 1 while the Price must be 15. I am getting confused. Could someone please give some math as to what should be divided or multiplied with the earnings or the price to find the value that is shown by the "Price at P/E=15" metric? I am very confused. This is one of the best articles for value oriented investors. 2 questions: I applied this chart to both GME and CPA and it applied a 15 multiple on the June qtr 2014 EPS versus the TTM EPS. FYI. I would imagine it should be applied to the TTM. Secondly, anythoughts on using the 5yr growth rate versus 15? Does it matter? I read the book also, I thought Lynch refered to the growth rate. Any feedback would be helpful. yes, it is applied to TTM EPS. The Peter Lynch Chart itself has been using 15. But you can certainly use growth rate. Can gurufocus or anyone please tell me the page(s) in "One up on Wall Street" where he align the value of the value of $1 in EPS to $15 in stock price? I read the book and pored through all pages on earnings but no-where did I find $15 in stock price aligned to $1 EPS, even in the pages mentioned by GuruFocus. Appreciate your help in this as I would like to read the alignment within the context in Lynch's book. Peixia, if you look carefully those charts, $1 of earnings at left axis is always aligned with 15 in stock prices at the right axis. Thanks for your prompt clarification. I notice the alignment in the Dow Chemical chart on p.165. And this is where I get confused. Aligning $15 stock price to $1 eps to derive an earnings line implies a one-size-fits-all fair-value p/e of 15 for all stocks. Correct me if I am wrong here but this is how I interpret the derived earnings line for comparison against the stock price. Yet Lynch in the last para on p.169 specifically highlights the avg p/e levels varying across slow growers, cyclicals and fast growers. He mentioned that looking to buy only low-p/e stocks did not make sense to him because what's a bargain for Dow Chemical isn't necessarily the same as a bargain p/e for Walmart. Therefore, a fixed fair-value p/e of 15 for all stocks run contrary to his comments in the aforesaid para on p.169. Agree with what you are saying but that was how he drew the charts. When you value the stock, you certainly have to look much more than just the charts. Peter Lynch did use PE=Growth rate for a lot of fast growers. Only works if you pay them $350 per year. 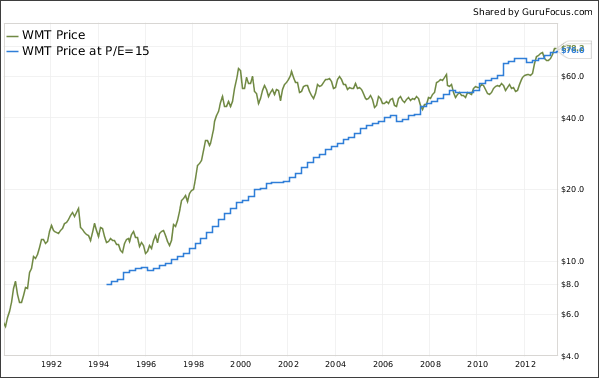 Over the very long term (like, past 100 years), the average stock traded at a p/e value of 15. This is where Peter Lynch gets the p/e value of 15. However, during this time the average stock also gave off something like a 4% yield, and right now yields are much lower (2%) so this is why the returns going forward in the stock market do not look as good as the 10.0% that stocks have returned historically over long periods of time. Over the very long term (like, past 100 years), the average stock traded at a p/e value of 15. This is where Peter Lynch gets the p/e value of 15. AAPL's current P/E is 13.25. Will it ever be above 15??? Can anyone advise is foxa a good buy based on the pe15 chart ? Is this only available to Premium members? Typically earnings are released on a quarterly basis, but I see in the example above, the frequency (stair steps) of the earnings line is monthly. What assumptions does Guru Focus make to produce an earnings line that updates monthly?